While fireworks only last a short time here on Earth, a bundle of cosmic sparklers in a nearby cluster of stars will be going off for a very long time. NGC 1333 is a star cluster populated with many young stars that are less than 2 million years old—a blink of an eye in astronomical terms for stars like these expected to burn for billions of years. This new composite image combines X-rays from NASA's Chandra X-ray Observatory (shown in pink) with infrared data from NASA's Spitzer Space Telescope (shown in red) as well as optical data from the Digitized Sky Survey and the National Optical Astronomical Observatories' Mayall 4-meter telescope on Kitt Peak (red, green, blue). The Chandra data reveal 95 young stars glowing in X-ray light, 41 of which had not been seen previously using Spitzer because they lacked infrared emission from a surrounding disk. 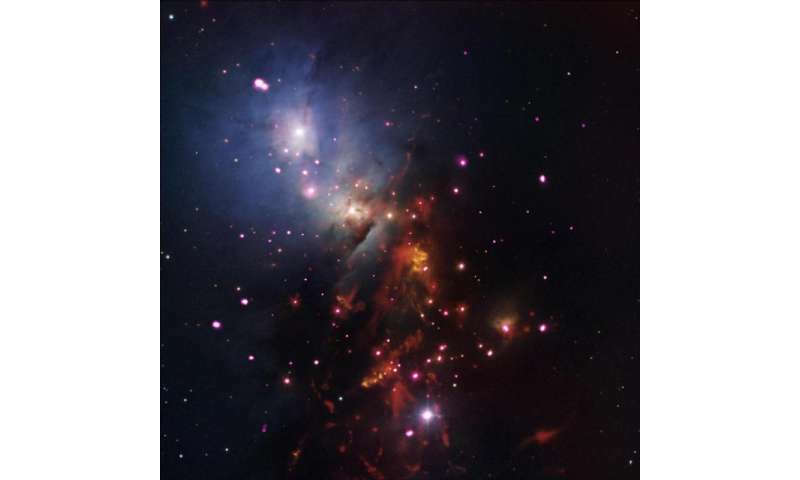 To make a detailed study of the X-ray properties of young stars, a team of astronomers, led by Elaine Winston from the University of Exeter, United Kingdom, analyzed the Chandra X-ray data of both NGC 1333, located about 780 light-years from Earth, and the Serpens cloud, a similar cluster of young stars about 1,100 light-years away. They then compared the two datasets with observations of the young stars in the Orion Nebula Cluster, perhaps the most well-studied young star cluster in the Milky Way galaxy. These results were published in the July 2010 issue of the Astronomical Journal.